Peptide QGESRRQEPGDFVKQ(C), corresponding to amino acid residues 29-43 of human GABRA3 (Accession P34903). Extracellular, N-terminus. Homology Rat, mouse - identical; bovine - 14/15 amino acid residues identical. Form Lyophilized powder. Reconstituted antibody contains phosphate buffered saline (PBS), pH 7.4, 1% BSA, 5% sucrose, 0.025% NaN3. Antibody concentration after reconstitution 0.75 mg/ml. 1. Anti-GABA(A) α3 Receptor (extracellular) Antibody (#AGA-003), (1:200). 2. Anti-GABA(A) α3 Receptor (extracellular) Antibody preincubated with the control peptide antigen. Transfected COS-7 cells (1 µg antibody/140 µg lysate) (Zhou, C. et al. (2013) J. Biol. Chem. 288, 21458.). Immunohistochemical staining of rat cerebellum using Anti-GABA(A) α3 Receptor (extracellular) Antibody (#AGA-003), (green), (1:100). 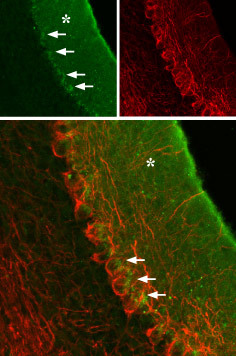 GABRA3 is localized to the molecular layer (asterisk) and a portion of the Purkinje cell body (arrows), which is outlined by axonal staining using mouse anti-neurofilament 200 (red). Cell surface detection of GABRA3 in intact living rat RIN-m cells using Anti-GABA(A) α3 Receptor (extracellular) Antibody (#AGA-003), (1:50) followed by goat anti-rabbit-AlexaFluor-550 secondary antibody. Extracellular staining (red) merged with live view of the cells. Mihic, S.J. and Harris, R.A. (1997) Alcohol Health Res. World 21, 127. Whiting, P.J. (1999) Neurochem. Int. 34, 387. Fuchs, K. and Celepirovic, N. (2002) J. Neurochem. 82, 1512. GABAARs are heteropentamers, in which all five subunits contribute to formation of the pore. Eight subunit isoforms have been cloned: α, β, γ, δ, ε, π, θ, and ρ.1 Six α subunits isoforms (α1-α6) have been shown to exist in mammals. In most cases, the native GABAA receptors consist of 2α, 2β, and 1γ subunits. 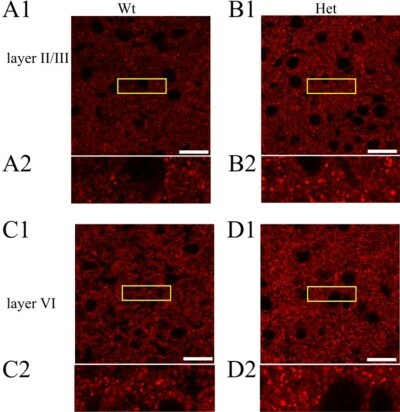 GABA(A) α3 Receptor expression increases in Heterozygous GABA(A) α1 Receptor knockout.Immunohistochemical staining of cortices from wild type (A and C) and Het α1 KO (B and D) mice in layers II/III (A and B) and VI (C and D) of the somatosensory cortex (white scale bar, 20 μm, n > 6) using Anti-GABA(A) α3 Receptor (extracellular) Antibody (#AGA-003). The yellow boxed areas are displayed on a magnified scale below each image (A2–D2).Adapted from Zhou, C. et al. (2013) with permission of the American Society for Biochemistry and Molecular Biology. Alomone Labs is pleased to offer a highly specific antibody directed against an epitope of human GABA(A) α3 receptor. Anti-GABA(A) α3 Receptor (extracellular) Antibody (#AGA-003) can be used in western blot, immunoprecipitation, immunocytochemistry, and immunohistochemistry applications. The antibody recognizes an extracellular epitope and is highly suited to detect GABRA3 in living cells. It has been designed to recognize GABRA3 from rat, mouse, and human samples. Seo, S. and Leitch, B. (2014) Epilepsia doi: 10.1111/epi.12500. Guinea pig and rat medulla. Inoue, M. et al. (2013) Neuroscience 253, 245. Zhou, C. et al. (2013) J. Biol. Chem. 288, 21458. Arellano, R.O. et al. (2016) Mol. Pharmacol. 89, 63. Transfected COS-7 cells (1 µg antibody/140 µg lysate). Park, H.J. et al. (2013) J. Nucl. Med. 54, 1263. Caspary, D.M. et al. (2013) Neurobiol. Aging 34, 1486.